In recent years there has been a sharp increase in the number and form of analyses to which Raman spectroscopy has been applied. The introduction of small bench-top spectrometer systems has certainly opened up the fields of study. However, on the back of the renewed interest in the Raman technique, ever more demanding applications have arisen. For this reason the next generation of Research grade instruments incorporate much of the cutting edge technology found in the bench-top systems, but also provide the higher performance required for samples which prove difficult or impossible to analyze with more routine instrumentation. The T64000 system is designed to provide a versatile platform for Raman analysis. It has an integrated triple spectrometer design for unprecedented optical stability. The instrument incorporates the proven technology of the confocal LabRAM Raman microprobe. The mechanical coupling is rigid and stable. The optical coupling is efficient and throughput is limited only by theoretical considerations. Holographic notch filter technology provides a very good solution to laser rejection for visible wavelengths in many applications. However, there are acknowledged limitations to the use of these filters for work close in to the laser line. Even with specially developed low frequency accessories(4) with many difficult samples it is still often impossible to obtain reliable data at 10 , 20 or 30 cm-1. In using the double subtractive configuration of the T64000, it is possible to obtain spectral information very close in to the laser line. The subtractive mode is ideal for studying such detail as LA modes in polymer systems and crystal lattice modes. This is of particular importance for the measurements of stress in semiconductor materials such as GaN, SiC and diamond where stress induced shifts in the order of 0.1 cm-1 are often studied. The high resolution also offers the level of accuracy required for the authentication and certification of materials for Raman standards. The T64000 has many benefits for deep UV Raman measurements. - The high stray light rejection enables lower frequency Raman bands below 100cm-1 to be observed even in the deep UV (244nm). It can provide a complete spectral analysis not limited in its scope or range. - The tune-ability of the double filter stage enables all the various deep UV frequencies to be accessed easily, (eg. 227-290nm). Hence, optimizing resonance enhancement for particular species of components (eg. proteins from DNA). - The specialized UV-VIS microscope option is adapted to working over a broad spectral range, without the need of optics to be removed or replaced. It preserves the high spatial discrimination across the wavelengths. 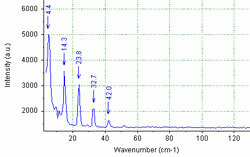 It also offers specialized UV enhanced image viewing of the sample, and all of the standard Raman mapping facilities. - The spectral resolution of the 640mm focal length, as with the LabRAM HR system enables Raman analysis to be maintained at a standard to high spectral resolution. The resolution of ~1.4 cm-1/pixel far improves upon the ~4 cm-1/pixel resolution of the small bench-top instrument found in the UV. The list of applications to which the T64000 can be applied is impressive including, thin films, solid state devices, biological chemistry and techniques such as UV, resonance Raman, PL and laser fluorescence. In Summary, for demanding applications and work which requires high laser rejection, high spectral resolution and the obvious advantages of a continuously variable laser filter, the triple spectrometer system is an invaluable tool. With the introduction of the latest technology from the smaller bench-top systems it can also be applied to more general routine analysis. The T64000 heralds a new era for new and more versatile high grade research Raman instrumentation. 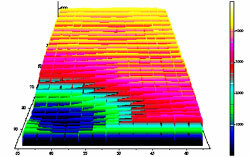 Spectrum of a proprietary SiGe material in which it is possible to observe spectral bands down as low as 4 cm-1. Raman Mapped image of Stressed Silicon interface using Single direct path operation.